Over the past decade, private LTE market has indeed gained renewed momentum as network-led transitions have dramatically transformed the way people & enterprises connect and communicate. While a plethora of wireless technologies exist in the communication cosmos, LTE has irrefutably been gaining exceptional acclaim among network managers and communication strategists alike, as the platform of the future. 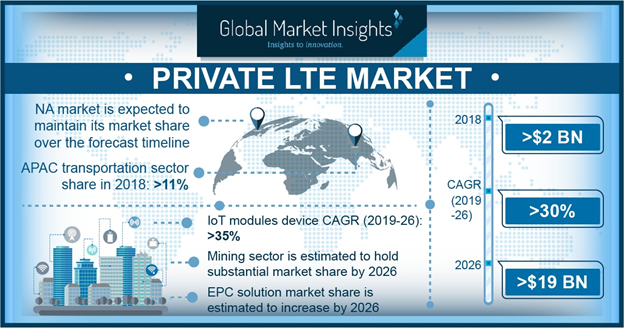 The global private LTE market is slated to garner quite some returns in the coming years primarily driven by the humongous proliferation of connected devices that excessively demand reliable and secured communication solutions. LTE networks offer a slew of opportunities and play an important role in connecting industrial systems and broadening the avenues of customer interaction and service delivery. With the onset of the IoT trend, the private LTE network is poised to stir up innumerable industries in the coming years, as these networks offer increased operational efficiency, high security for enterprise applications, low latency, and reduced deployment costs as compared to public networks. Nokia has reportedly been awarded a new project by Elektro, a Brazilian electricity distributor, to install a private LTE network to power its electric vehicles, smart grids, and smart meters in the Atibaia municipality, located in the state of Sao Paulo, Brazil. This private LTE deployment would provide Elektro with widespread coverage, large-scale connectivity, and high-bandwidth solutions needed for extending the potential of its supply grid, thereby making the grid much smarter. Redline Communications?Group Inc., the world leader in providing wide-area wireless networks for the extremely challenging applications & sites, recently announced significant upgradations and additions to its?iLTE™ product catalog, the firm’s Private LTE Infrastructure service. This robust product portfolio based on the 3GPP LTE mobility standard extends a wide range of features. The product was also employed in mixed LTE provider settings and exhibited the capability to interoperate with other providers. iLTE™ is also effective in connecting commercial and industrial handsets, IoT devices, and mobile routers in severe environments such as offshore Oil & Gas applications and mining sector. China Unicom and Nokia have developed a private LTE network for a BMW Brilliance Automotive facility which is located in Shenyang city in China’s Liaoning province. The Nokia vMEC (virtualized Multi-access Edge Computing) solution will utilize China Unicom's 4G LTE network to give low-latency support for smart production activities at the BMW factory. The new network solution enables enterprises to connect factory assets through sensors and automate tasks such as material handling, video scrutiny, and video analytics, thereby delivering enhanced operational efficiency and decreased expenses. At CBRS annual meet, Athonet, Federated Wireless, and Accelleran demonstrated a full end-to-end, plug-and-play marketable private LTE network platform for CBRS which scales on the private or public cloud to reach loads of users and thousands of small cell radios. The new platform allows telecom providers or enterprises, governments, venue owners, and other end users to implement localized CBRS networks with enhanced simplicity and decreased cost. These illustrations quite vividly enlighten the fact that private LTE market majors and other participants are already ensnared about laying a concrete foundation for a connected future. In effect, it wouldn’t be incorrect to state that the new mode of communication brought forth by private LTE solutions has extensively transfigured the traditional connection approach. Indeed, industry experts deliberately assert that this implementation of cutting-edge networking technology is virtually disrupting every single industry vertical and has significantly upped the growth prospects of the private LTE market.